Round-up The week has seen an acceleration of NVME news - Aparna, Intel, Micron, and XIO - and cloud-related news as well, with Rubrik picking up a huge funding round. These were the headline items but there was a whole lot more going on and here's a representative selection. Backup provider Code42 is partnering with Okta, which it calls the leading independent provider of identity for the enterprise. Okta's single sign-on authentication works alongside Code42's data security and visibility tools to help protect data shared in the cloud. Through Okta, IT can manage employees access to any application or device, allowing users to sign on across domains with a single online identity. Joe Payne, CEO and president at Code42, issued a canned quote: "Our customers are deploying in the cloud at an increasing rate and to do that effectively they need the world's leading cloud-based identity security technology." The company's CTO, John Durant, said: "This partnership helps organizations strike the balance between data security and user productivity. By running unobtrusively in the background, it allows users to quickly start doing actual work while giving administrators peace of mind." Code42 has a technology integration with Okta and its Identity Cloud. By passing authentication details from the users' organisational credentials to the service provider in a secure and private manner, Code42 customers can sign onto a secure cloud from different organizations and multiple points of entry. The Code42 customers can also sync users and groups with Active Directory for free via Okta Cloud Connect (OCC). The linking of security and backup in the cloud is becoming stronger and stronger. DVX storage array supplier Datrium, in a move that will baffle and surprise Sphere3D doubters, has partnered with Sphere3D to the extent that the latter's HVE line has obtained "Datrium ready" nodes certification. Sphere 3D is offering Datrium Ready Nodes on its HVE server line. Datrium marketing VP Craig Nunes told us: "We have primarily been working with the HVE guys. They have been doing good business with us in the channel, and was the impetus for them creating the Datrium Ready Node bundles." Datrium's own DVX Compute Nodes are Dell-based. Sphere 3D bought HVE (Hybrid Virtualization Engine) ConneXions in January. Previously it has experienced an angry investor pushing for a major restructuring, and it’s odd microvisor line has puzzled people, along with its consistent multi-quarter, multi-year loss-making. HVE “Datrium ready” node bundles combine Datrium DVX data nodes with HVE servers as compute nodes. The servers are preconfigured with Datrium DVX software and host-local flash, together with the appropriate networking to support a turnkey implementation. Virtual Desktop Infrastructure (VDI), bundles are benchmarked to provide 250, 500, or 1000+ virtual desktops with predictable end-user friendly performance and scalability. Time to re-evaluate Sphere 3D then. End-point protector and file sharer Druva, calling itself a cloud-first SaaS supplier, has set up new cloud data centre offerings in Canada, the UK and Hong Kong. It says customers there can host their data in locations that best meet their specific requirements around data residency, location and transfer. They can run secure deployments in compliance with local and regional data protection and privacy rules. For example, Canadian customers can store data in accordance with the Personal Information Protection and Electronic Documents Act (PIPEDA), which sets guidelines on how, and where, Canadian citizen data is stored. In the UK, as it begins the process of leaving the European Union, as part of Brexit, Druva says its data centre "will be critical for meeting data sovereignty regulations." And the new Hong Kong region will give customers there the ability to meet the varying local data protection guidelines of the region. Druva's public cloud is based on the public cloud vendor infrastructure, such as Azure. Check out Druva's public cloud features here. The company stresses that Edge object storage is fast, claiming that its Quick EC technology works without affecting read or write performance. It "eliminates the performance penalty usually associated with accessing objects in traditional erasure coded solutions and is especially beneficial, for large capacity S3 object clusters." Carrying on the Edge product's container focus, the Docker Engine plug-ins enable integration into any Docker Enterprise Edition deployment and users can deploy storage and application services as containers, across servers that provide both storage and compute in a container-converged model. This news snippet is another pointer to the worth of Toshiba's memory business. That memory business sale saga is ongoing. A JP Morgan analyst, Rod Hall, thinks that if WDC were to buy the thing it could see its earnings go up 30 per cent. An $18bn deal to buy the memory business could be entirely debt-funded. This Barron's blog has more on the topic. WD CFO Mark Long said: "We are deeply troubled by the tension between the depth of Toshiba’s desperation and their willingness to do things that we didn’t think they would do in other situations. A lot of this, in the initial phases, is going to be overshadowed by the desperation of Toshiba to deal with their crisis as it has grown from a problem to an all-consuming disaster." WDC reckons it has veto rights over any sale, apparently disputed by Toshiba, which could get cash for its recapitalisation from higher bids than WDC's. DCIG says its 2017-18 Small/Midsize Enterprise All-flash Array Buyer’s Guide id available. It says the guide weights, scores and ranks more than 100 features of twenty-four (24) small/midsize enterprise-class all-flash arrays that achieved rankings of Recommended or Excellent. These products come from eleven (11) vendors including Dell EMC, Fujitsu, iXsystems, Kaminario, NEC, NetApp, Nimble Storage, Pivot3, Pure Storage, Tegile, and Tintri. E8 Storage says a major but unnamed financial institution in New York City has deployed its high-availability, shared NVMe flash storage E8-D24 appliance, using dual-port Intel data centre SSDs. The E8-D24 shared storage replaces local SSD storage in servers because the NVMe speed network access is effectively as fast as local SSD access and provides a larger and shared flash store than a individual server or workstation's direct-attach SSDs. 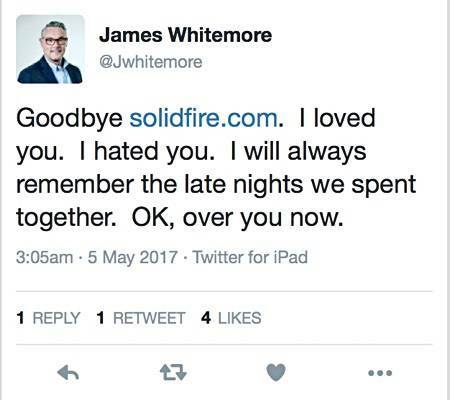 NetApp is closing down separate SolidFire.com, with marketeer James Whitemore saying: "Today (Friday), everything gets fully Intergrated into NetApp.com." Red Hat has made its Gluster Storage usable via its OpenShift Container Platform available on Amazon Web Services (AWS). This is part of a wider Red Hat move to work with AWS. OpenShift involves running Kuberbetes-orchestrated Docker containers in servers in an on-premises data centre or the public cloud. Virtual SAN provider StorMagic has announced the full release of StorMagic SvSAN 6.1, with new features like predictive caching, automated storage tiering and a range of management capabilities, for purchase and upgrade. London-based Coreix provides hosting services to more than 600 customers in sectors that span financial services, government, oil and manufacturing. It's using StorPool virtual SAN software for a new public cloud platform, which starts at more than 300,000 IOPS and can grow to over one million sustained IOPS and 2PB of scale. The initial deployment was a cluster of six servers with two CPU cores, 8 GB RAM and 0.2 ms latency for Coreix public cloud customers. It will deploy StorPool to serve its hybrid and private cloud customers too. I'm writing this at a Barracuda Network's conference. That company feels the momentum if the public cloud wave and is riding it. Already a majority of its customers have bybrid on-premises/public cloud environments. But Barracuda isn't exposed to the NVMe wave that is affecting enterprise data centres. That wave was strongly boosted this week by Aparna, X-IO and its Axellio array, Intel with P4500 and P4600 SSDs, and Micron and its SolidScale array. E8 picked up a customer for its NVME-over-fabrics class array. Over the next few years SATA and SAS SSD use will dwindle in enterprise data centres and NVME-over-fabrics-class shared array access will become widespread. All well and good but what's with the CFO slot?